Many brides and grooms from Washington, DC, want their wedding and engagement photos to look and feel Washingtonian. Whether they grew up in the Nation’s Capital or not, Washington has often played a role in their love story. Washington-based spouses-to-be have often met and fallen in love there. As a result, fiancés who get engaged and married in DC frequently feel a connection to the city. They therefore want their wedding and engagement portraits to include notable elements from the Nation’s Capital. It is the responsibility of their DC wedding photographers to give them exactly that. The future spouses in this engagement portrait were not from the Nation’s Capital, as it turns out. But the city still played an important role in their path to the wedding altar. After meeting at Wake Forest University, they moved to Washington, DC, metro area for work. It was while in the region that they decided to get married and spend their lives together. This bride- and groom-to-be even chose to have their wedding in Washington. They will tie the knot at the exquisite Dahlgren Chapel of the Sacred Heart. This church is part of the Georgetown University campus and a spot in which many alumni get married. After they officially become husband and wife, this couple will celebrate with their wedding guests at the Omni Shoreham Hotel. That luxury venue for wedding receptions is located between the posh DC neighborhoods of Adams Morgan and Woodley Park. Like other couples whose love story starts in DC, these two wanted the Nation's Capital to feature in their engagement photos. Fortunately for them, the city is filled with iconic buildings and landmarks that are unmistakably Washington. That is also a good thing for a Washington, DC, wedding photographer! They literally have no shortage of backdrops for the couples portraits they take. DC wedding photographers can use recognizable Washington icons like the White House, the Washington Monument or the various Smithsonian museums. When they photograph fiancés or newlyweds posing in front of Washington landmarks like the US Capitol, everyone knows in which city they captured the resulting wedding and engagement images. 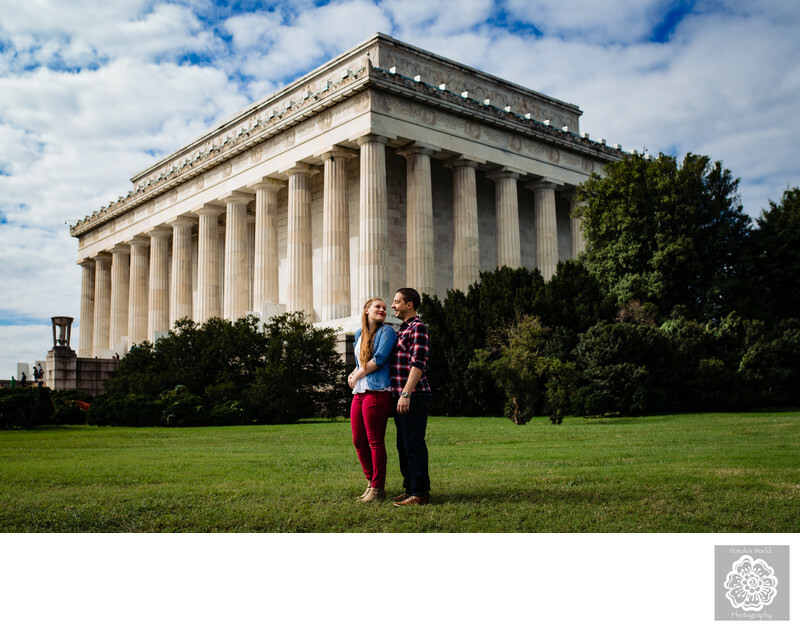 It does not hurt that those Washington, DC, landmarks also look great in a couple’s engagement pictures! As DC wedding photographers, we particularly like the elegance of the Lincoln Memorial. Its fluted Doric columns are both classically beautiful and recognizably “Washington.” They are also very versatile, from a photographic point of view. Engagement photographers can pose fiancés and newlyweds between them and take closeup pictures. This makes for beautifully intimate wedding and engagement portraits. Shutterbugs can also bring spouses-to-be to the lawn around the Lincoln Memorial for more expansive shots. This allows for portraits with a Washington icon behind future brides and grooms. We chose the latter approach for this engagement photograph. The bride-to-be was wearing very colorful clothes, and the sky above Washington was clear and sunny. We wanted to use these to create a vibrant “summer in Washington” image. So we stepped back with our cameras to include the green of the grass, the blue of the heavens and the white of the Lincoln Memorial. In doing so, we created a perfect Washington, DC, engagement photograph. Both beautiful and Washingtonian! Location: Lincoln Memorial, 2 Lincoln Memorial Cir NW, Washington, DC 20037. Keywords: engagement photographers (3), engagement pictures (3), Washington engagement (3).